A Head chef who cooks for a variety of cultures is in the running for a top award after transforming the cuisine at a care home with restaurant-style a la carte menus. Anthony Dyer may have only been at Penylan House Community Nursing in Cardiff for just over a year but he has impressed both staff and residents with the restaurant quality food he serves up on a daily basis. In what is his first head chef role, the 42-year-old from Barry has to produce both kosher food for Jewish resident and halal food for Muslim residents, as well as meeting numerous dietary requirements, such as purée and diabetic friendly dishes. It means Anthony has to operate two separate kitchens but that hasn’t stopped him from introducing more menu options for residents throughout the day, which is a far cry from the “standard” meals offered previously. His hard work has led him to being shortlisted for the Catering in Care award, at the Wales Care Awards 2017, which takes place at City Hall in Cardiff on November 17. The prestigious national awards, run by Care Forum Wales and dubbed the “Oscars” of the care industry, acknowledge the hard work and exceptional performances of those in the sector. Anthony said: “It came as a big shock, I really didn’t expect it, but it’s a nice shock that’s for sure. I’m very proud. “It’s nice that the residents appreciate the time you put in and also the rest of my staff, who are all so hard working. You can’t do it all by yourself, you need a good team which is what I have got. The father-of-two, who is originally from Nottingham, previously worked at the four-star Coed-y-Mwstwr Hotel in Bridgend as a junior sous chef. He then moved into the care sector after landing a second chef role at Cardiff-based Sunrise Senior Living where he worked for eight years before making his mark at Penylan House. Anthony said: “A friend had gone to Sunrise and asked me to go and give him a hand. He wanted me to help change the menu from basic care food to hotel standard. “It’s now like home food but with restaurant quality and presentation. We are giving the residents the whole dining experience, which includes being served and waited on. “We offer the choice of a meat or fish dish at lunch and then the option of a hot meal in the evening. He added: “Cooking for the different cultures was a real challenge initially. We have the general kitchen for 60 residents and then the Jewish kitchen to cater for 12. “There was a lot to get used to. You can’t mix dairy and meat and they can’t have certain products at certain times of the year. “We recently celebrated the Jewish new year and did a cold buffet for 40 – including family members and visitors from Jewish community groups. Having made the move into the care sector, Anthony doesn’t see himself ever returning to the hotel and restaurant trade. He said: “I prefer this so much more. It’s more homely for a start. In the hotel trade you never see the same people day in day out, bar the staff. “I’ve enjoyed getting to know the residents here. I look to them as though they’re my grandparents. “It’s been a real positive getting to cook for the different cultures and the same people. They’re almost like family. Anthony added: “When I first came they weren’t too sure about me I don’t think. “But I’ve had good feedback on the food and they say they can tell a difference in the food when I’m not in. In nominating Anthony for the award, care home manager Kay Mitchell commented: “The catering at Penylan House can be challenging at times, simply because of the diversity of cultures within the home. “Penylan is known as the Jewish home and as most will know, the food of the Jewish culture is paramount to beliefs. 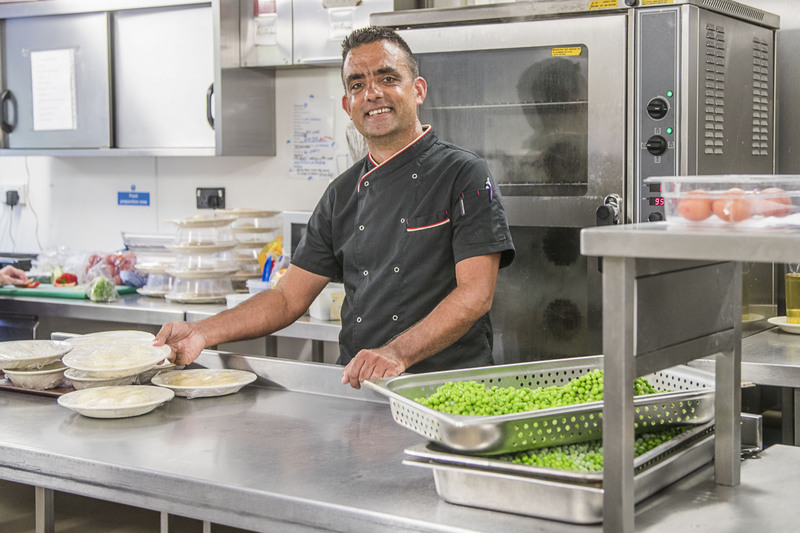 Tony joined Penylan and has made such a difference to the dining experience, offering not only a much liked Kosher diet and a la carte menu but also caters for all tastes and nutritional needs. “Tony oversees two kitchens. It has been a huge learning curve for Tony, ensuring the Kosher diet and all Jewish festivals are done right. The awards ceremony will be hosted by tenor and radio presenter Wynne Evans, better known as Gio Compario from the Go Compare TV ads.